Come to the Queen City the first weekend in May for a great train show! 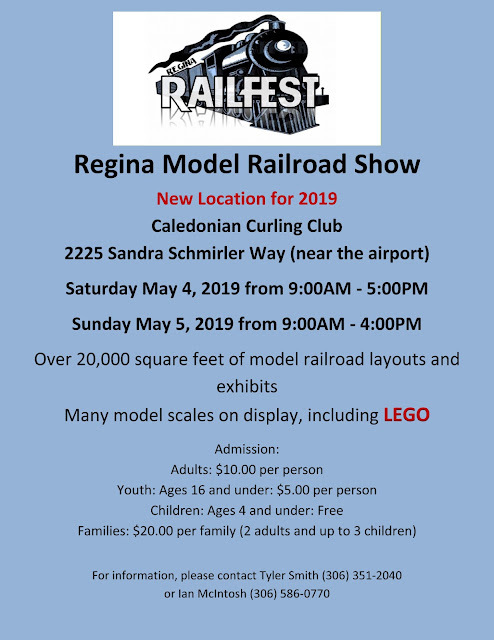 The 2019 annual Regina Rail Fest Model Railroad Show is being held on Saturday, May 4 and Sunday, May 5 at the Caledonia Curling Club, 2225 Sandra Schmirler Way. This a new location for the show, and it’s near the airport. There's over 20,000 square feet of model railroad layouts, displays, exhibits, and vendors, including Lego! Hours are from Nine to Five on both days. Admission is $10.00 per person, youths 16 and under get in for $5.00, children age four and under get in for free!